Which is best- ePub or Mobi? Which is best ePub or Mobi? Today, E-books have become the main aspect of the digital age. Thanks to technology, Users are turning to eBooks for a new age of reading books. You can now get your hands on any of your favourite books, without actually carrying them, anytime you want. This is because Technology is now available to everyone. Most of the major websites that deal in books along with dedicated e-book stores are offering eBooks now. Furthermore, as almost everyone is using a smartphone or tablets, getting eBooks is pretty easy. Hence, You can now download eBooks onto electronic devices directly from the store and read at your convenience. E-books give you a chance to get your hands on the existing hard copies of the books and titles in an electronic format. Publishers came out with eBooks to answer one major question. This question was that, could you make a system where you can access multiple books without carrying them around. Though paperbacks and hard copies of the books are still in use, e-books are picking up fast. Instead of waiting for many days for the hard copy of the book that you have ordered, you can get hold of your favourite eBook titles in a matter of few minutes. Experts have been trying to study as to why e-books have gained such popularity within a short span of time. E-books give you a chance to browse through thousands of titles online. Also, you can download the titles you want directly onto your devices. Consequently, as e-books became more popular, it got its specific e-readers. With the help of e-readers, you get a host of options to customize your reading experience. These e-readers have their dedicated online stores from which you can browse through the titles and download the ones that you find to be interesting in just a few clicks. When you compare eBooks to the hard copies, you get to download or purchase the e-books at comparatively lower prices. At times, various e-books can also be purchased or downloaded for free. Hence, website deals help in a free purchase. E-books provide you with the comfort of reading your favourite titles at your convenience. As these e-books can be carried around in your handheld devices when you travel around, you can read them anywhere too. If you compare eBooks to the regular books, you get to browse and choose from a wide range of titles from the website or the app store. In the case of eBooks, you never miss out on your favourite books. This is not so in in the case of the regular books. Thus, regular books are available only within the stock period. Using e-books for reading provides you with a chance to annotate pages and put bookmarks anywhere. However, in regular books, if you cannot get hold of a bookmark, you would have to dog-ear the pages. Unlike regular books, you can never lose e-books because even if you delete by mistake, you have the option of downloading them again. Thus, a simple visit to cloud account will get your content back. One thing to note is that many of the publishers tend to produce both the hard copy as well as the e-book versions of the same book at the same time. This way, you can purchase the book in any format that you want. As for the e-books, the commonly available formats that these e-books are available in including the ePub, MOBI, PDF, TXT, HTML, and RTF. Apart from this, several more e-book formats are currently available in the market. Before you choose to download or purchase the e-book, make sure that your device, is compatible with the format of the book. Here is a list of devices along with the compatible e-book format that you can download at you wish. 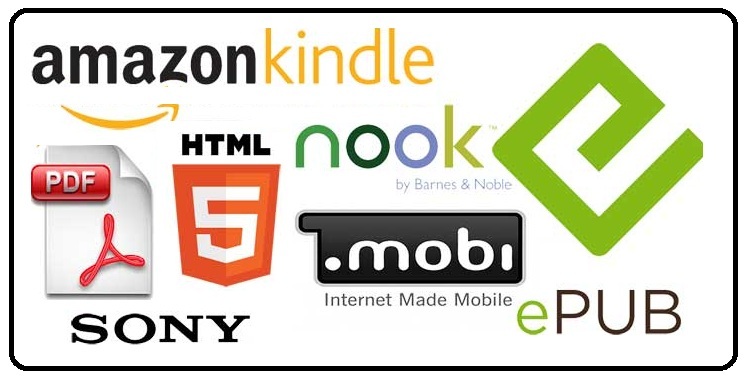 Out these formats, ePUB and MOBI are the two most widely used e-book formats in the market. One thing to note from the list given above is that ePub seems to be the most standard format that you can use with nearly all the devices. ePub is a file format that is the vendor-independent XML-based format, available for e-books. Developed by the International Digital Publishing Forum (IDPF), ePub has become very popular among the readers. Due to its simple design and the support of the format, many publishers, as well as readers, opt for this eBook format. Apart from the e-readers, you get to access this e-book format even on your handheld devices like the smartphones and the tablets. Needless to say, ePub goes with any device running on Android, iOS and other systems that are currently available in the market. ePub allows the reader to get the e-books as a reflowable. This feature allows you to customize the display of the text according to your device. Along with this, it also supports the fixed-layout content. Just like the ones in an HTML site, ePub allows you to get inline raster and vector images, along with metadata and CSS styling. If you feel there is a need to highlight particular sections of the e-book, you can easily highlight the required parts of the text. ePub offers a library that you can use to store the books that you have read or wish to read in the future. ePub provides support for a subset of MathML. Also, you can change Background colours along with the text size, according to your wish and need. You can bookmark pages in your e-book at which you have currently halted your reading. 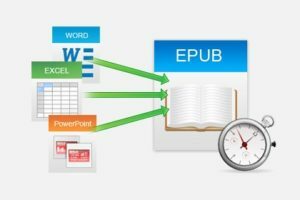 Though ePub and MOBI are widely in use, there are a few differences that set the two of them apart. Before downloading the book, you might wonder whether to choose an ePub or MOBI format for a book. Both them have both similarities as well as dissimilarities between the two. Amazon got the owner rights of MOBI, and thus most of their e-books come in this format. On the other hand, when it comes to the ePub format, you shall need to use a converter to convert the ePub to MOBI format. Android devices and the Kobo e-readers, support both the ePub as well as the MOBI format. However, Barnes and Noble’s Nook, and the Sony reader support ePub format but not the MOBI format. Both the ePub format as well as the MOBI format can be purchased either with DRM support or without it. If you wish to access the e-books that have this DRM support you can. Thus, ePub allows you to download the ADEPT support to open this DRM based files. While in the case of MOBI format e-books, downloading ADEPT to access DRM files is quite impossible. Choosing between ePub or Mobi, here’s another important factor. ePub file format openly supports the audio files that are available along with the e-books. Be it the separate audio files or the ones that come along with videos; ePub offers support for the sound system in the text. When it comes to the MOBI files, you may a tough time to access audio files. This is because MOBI file format does not support the sound system that comes along with the e-book that you have on the device. Converting one file format to another has become a great deal easier with the availability of several file converters. More than an option, these file converters have rather become a necessity for everyone. These file converters have made it possible to use the file formats which are not viewable with individual devices. For instance, Amazon Kindle makes use of MOBI format rather than the ePub format. In this case, you can use the file converter available online to convert the ePub to MOBI files. These file converters have been introduced for a purpose. It is to make sure that you get to access any book without pulled down by the different file formats. Compatibility of file formats plays a significant role in making sure that the e-books are viewed properly on the respective devices. So the next time if you have either ePub or MOBI files, just get the converter to change the files. With everything said and done, experts and readers having a winner. They state that when it comes to ePub or MOBI, ePub file format seems to be more user-friendly than the MOBI files. Moreover, these ePub files have a secure access and have better clarity and display specifications. Comparatively, MOBI files and have come as a boon to all the publishers. In conclusion, if you wish to get an e-book that comes along with better specifications and user-interface, the ePub file format is the right way to go about it.